Stuff. Comedian George Carlin said all we need in life is a little place for our stuff. When you get tired of it all, a consignment store is the perfect place to get rid of it all, or increase your stuff quotient. Here are the 10 best in New Mexico! Trying to find your clothing style? Bored with mall shopping? This consignment store has a little bit of everything from modern to retro, to casual and formal wear. It’s like shopping in the best closets in town, all in one place. New items arrive weekly. Be the best dressed woman in town at half the price. This store is huge. There’s 14,000 square-feet of browsing through a diverse and useful assortment of items and one-of-a-kind deals. Clothes, furniture, kitchenware, artwork, books, antiques, shoes, jewelry and so much more you’ll need a shopping cart to collect it all. If you’re looking to get rid of some things, consignments are taken on Friday. Lightly used and unwanted clothing and accessories is the focus of this large 6,000-square-foot store. There are about 2,500 consignors, so the store truly offers a mixed bag of styles and brands and accepts a wide-range of clothes. Plus, there’s always a deal on hand. The longer the item is in the store, the lower the price. A few antiques are scattered about too. Local owners have kept the doors open for more than 20 years. You’ll find a sizable selection of name brand purses, clothes, shoes and jewelry from the likes of Chicos, Coldwater Creek, Louis Vuitton, Tory Burch and Michael Kors. The proprietors buy items outright or consign them. Customer service even includes pick-up. Find your next pair of Ray-Bans or Loeffler Randall sandals right here at a price you’ll love. Why buy new when, with a little time and effort, you can find a gently used item for a fraction of the cost. There are treasurers everywhere here, all at reasonable prices. Vintage collectibles, leather jackets and cowboy boots, furniture, jewelry—just a little bit of everything from people’s lives. Consign outright or trade something in and get 30 percent of the assessed (by the store) value. Appointments a necessity. 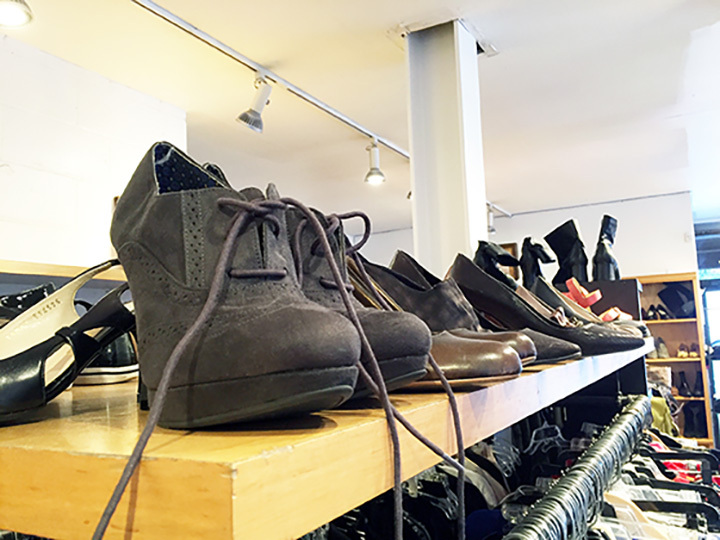 There are men’s, women’s and children’s clothing at this upscale consignment boutique. All is in excellent condition, a variety of sizes and styles and well-known brands. Accessories include shoes, belts, jewelry, hats and purses. You might even find that perfect end table in the small selection of furniture on-hand. Open every day. This small store is chockfull, from floor to ceiling of cool stuff. Clothing for all ages and genders. Furniture, brick-a-brac, knickknacks, household items, kids toys and things for the garden. Even those on a shoe string budget will find something affordable here. Closed Sunday and Monday. The town of Roy is a blip on the map, located at the intersection of Highway 39 and 120 in the northeastern part of the state. But don’t miss it, because it’s home to this phenomenal all-things-ranch shop. Their motto, “You’ll find something old, something new, nothing borrowed and everything true … true western. They buy and sell furniture, antiques, knickknacks and hand-made items. Closed on Sunday. With consignors from all over the United States, this 3,500-square-foot store always has something interesting to buy. Plus, the inventory is eclectic and varied, providing those looking to buy or sell a welcoming outlet. Highlights here include pre-owned furniture, fine art, collectibles, jewelry, home decor and antiques. Inventory changes regularly to keep the store interesting. New furniture can break a budget, so buy gently used instead. This store specializes in providing a large selection of tables, couches, lamps, chairs, bedroom and office furniture, home accessories and fine art, everything needed to furnish a home. New, used merchandise comes in regularly. Buy or consign. Open seven days-a-week. Call for an appointment or pick-up.